She knew she couldn’t be the only one in this predicament — that “a lot of my classmates had experienced similar situations where they were in class or going to class and suddenly got their period and were not able to go to class or had to scramble,” she said. It’s part of a global movement — partially funded by feminine hygiene product manufacturers—to bring periods into the consideration of mainstream policymakers. A documentary about“period poverty” — the reality that some women miss work and some girls miss school because of cultural taboos or because they can’t afford period products — won an Oscar this year. 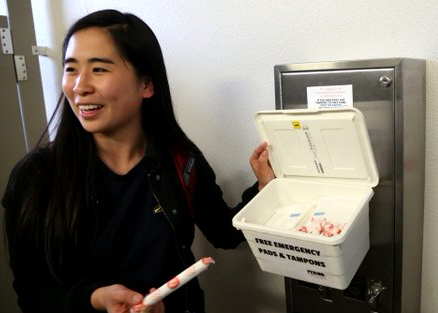 Already in California, public schools in low-income areas are required to provide free period products, and college students are petitioning for free products in state universities. And an ongoing state Superior Court case claims the state is violating the 14th Amendment equal protection clause by taxing the sales of period products, arguing that tampons and pads are not luxuries. “It allowed a conversation to happen that was more than a tax — it’s about menstrual equity and our biology,” she said. But Jerry Brown isn’t alone. Editorials in newspapers such as the Los Angeles Times have contended that it’s unwise to carve out exemptions from state sales tax in such a random fashion—especially when the state taxes items equally as essential, such as toilet paper, diapers and toothpaste. The California Tax Reform Association criticized the bill for drawing a line new to the state sales tax: “gender necessity. … The problem with drawing such a line is that many possibilities for exemption follow the logic of gender specificity. Clothing, cosmetics, over-the-counter and pharmaceuticals are all examples of products that can be construed as both gender-based and necessary,” the association noted.